Looking for a quick getaway this summer? Escape the ordinary and head on up the road to Phenix City, AL. 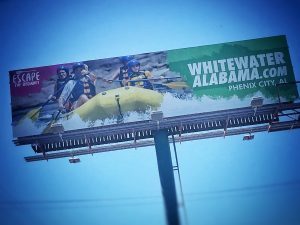 Experience Whitewater Alabama, home of world-class rafting. Raft down the Chattahoochee River, boasting the longest urban whitewater rafting in the world. The course has been described to be as “wild as Colorado and warm as Costa Rica.” Not quite brave enough to jump into a raft just yet? Warm up your adrenaline with the Blue Heron Adventure Zip Line. Take flight crossing the Chattahoochee River and experience the only dual-zip line that connects two states reaching speeds up to 40 mph. Durden Outdoor is excited about our new partnership with Whitewater Alabama. Utilizing a mix of rotary posters and a premium bulletin, they are able to target locals as well as vacationers traveling through the Wiregrass. Their rotary posters are strategically placed on high traffic routes including Restaurant Row along Ross Clark Circle, Main Street and Hwy 231 North. Their premium bulletin can be seen on Hwy 231 South, Alabama’s most traveled highway to Florida beaches. Check out all of the many adventures that they have to offer at WhitewaterAlabama.com. If you would like to become FAMOUS, please contact one of our sales representatives today at (334) 792-5056 or sales@durdenoutdoor.com. According to a recent OAAA article, Neilsen just released data that examined Facebook, Twitter, Instagram and search activation. The verdict? Out-of-Home was decidedly the best media channel for driving online activity per ad dollar spent. There were several components that Neilsen reviewed when collecting the data. They first reviewed the amount of consumer online activity each media channel generated. In the past six months, 46% of search was activated by outdoor advertising. Behind search, Facebook came in at 38%, 25% in Instagram and 23% in Twitter. The amount of ad spend share for each media channel verses the amount of online activation proved that Out-Of-Home returns four times the expected rate given its relative ad spend. With specials changing weekly, Eagle Eye Outfitters is one of our many clients who use the Durden Digital Network to keep their ads fresh and up-to-date. Recently, they launched a new website, ShopEagleEye.com, and utilitzed digital billboards to encourage the Wiregrass to “Shop Online.” Consumers are constantly looking for convenience. This was a great way for Eagle Eye Outfitters to motivate their customers to engage online while at the same time keeping their brand top of the mind. Let us work for you! 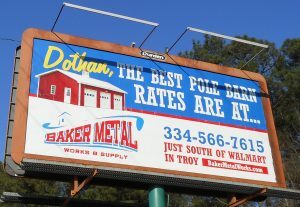 For more information on how to make your ad dollars extend further and engage online activation, please contact one of our FAMOUS Makers today at 334-792-5056 or sales@durdenoutdoor.com.